Looking for an intelligent, low-maintenance dog? A dog that can be house broken fast? Well, then the Doberdor is just the dog for you! Haven’t heard of the Doberdor before? Well, let me introduce you! The Doberdor is essentially a mix between a Doberman and Labrador Retriever, also called the Doberman Lab Mix. This one is a big dog and in my opinion looks more like its Doberman parent. The pup may inherit either the solid coloring of its Lab parent or the patterns of the Doberman. So, if you’re looking to get yourself a new lab Doberman mix doggy friend, then you should do your research! Why? So that you know exactly what you’re getting into and you can take care of your new doggy friend. Let’s get to know the Doberman and Lab mix! Okay so let’s talk about the looks! Both the parents of the Doberdor are of similar size, so it’s safe to assume that your puppy would grow up to be a large doggy. But, both Doberman and Labrador look very different from each other. Well, chances are that your Doberdor puppy is likely to favor one of its parents over the other in terms of looks. So for that, we’ll have to go into detail about both it’s parents! So, you may know that Labradors come in three colors: golden, chocolate and black. On the other hand, Doberman Pinschers have a pattern of black and tan, or, chocolate and faun. So, the Doberdor pups may inherit either the solid color of the Labrador, the patterns of a Doberman or a combination of both. Now, let’s talk about the size, shall we? 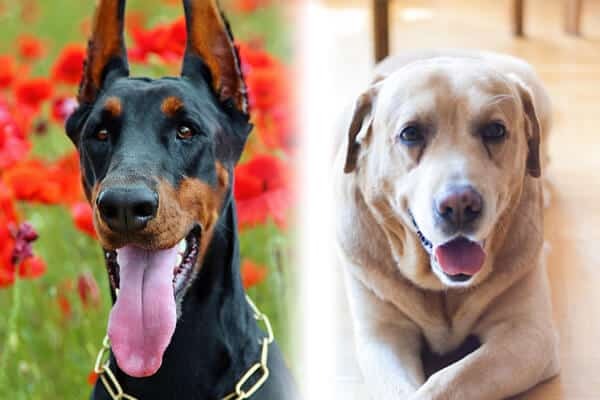 Since both Labradors and Doberman are large dogs, the Doberdor puppies have a large, solid frame.Other than that, your Doberman Lab mix will most likely have folded ears and long, thick and strong tail. There’s another thing! Since Labradors are water retrievers, they have webbed feet (which helps them in swimming) and your Lab Doberman mix may also inherit that as well! The Doberman Lab mix lifespan ranges from 10-14 years, but it all depends on how you take care of your doggy friend. And, let’s finally talk about the weight! The Doberman Lab mix weight is around 60-100 pounds, and as you can imagine, it’s a heavy dog! Basic Behaviour Traits: What Am I Getting Into? So, like I’ve said before, you should get yourself a dog which not only suits your lifestyle and preferences but also, suits your basic needs, since getting a doggy is a big commitment. Since the Doberdor is a mixed breed, it inherits personality traits from both its parents. The Doberman lab mix temperament is hard to predict but this doggy is usually loyal, loving, alert, and sociable and also, makes a good watchdog! Doberman Lab Mix dogs are on of the most affectionate breeds.They have an unconditional love and care to give! This is something that they get from their Labrador parents! Mixed breeds are probably more intelligent than purebred dogs and the Lab-Doberman mix isn’t an exception since both of its parents are intelligent. This means that your dog will get trained easily and quick to pick up anything new! The downside of having an intelligent dog is that your doggy friend will have a mind of its own and will be a tad bit stubborn. The key here is to use positive reinforcement rather than negative reinforcement! This dog has been labelled as the velcro dog because its extremely attached to it’s family. Your doggy will love getting attention, and would always want to spend time with you and your family! The protective instincts are strong on this one as they get it from their Doberman parents. Training is key over here! How often will I be taking it to the Groomers? And What About Walks? Let’s start with grooming, shall we? It’s kind of tricky to explain, but you’ll get it! Grooming Needs: All About Doberdor’s Bath Time! Okay. so this is a little tricky, but I’ll do my best to explain. Okay? Let’s talk about the grooming needs of the Lab and Doberman for a better idea! They are a little high maintenance when compared to the Doberman. This is mainly because the Labs have a double-layer, thick coat. They also are prone to shedding, so you’ll have to brush them out once or twice a week. I use the Pet Portal Brush on my Lab. Labs also have an oily which means more bath time! You’d want to use a mild shampoo, like the Duke & Daisy Oatmeal and Aloe Shampoo on your doggy’s skin. The Doberdor is a very active dog and you’ll need to take yours on a walk at least twice a day. They love their walks, and the longer the walk, the happier your dog would be! Also, the Doberman Lab mix loves swimming! So, this makes the Doberdor a perfect outdoor companion! Yes, they can be trained! In fact, it’s very easy to train them! The Doberdor has intelligent parents that are easy to train, and so, naturally so is the Doberdor! In fact, a Doberdor pup is quick at grasping new things and is an enthusiastic learner! But be patient with your little puppy! Make the training session fun for your puppy by introducing new activities, but keep it short! About 10 to 15 minutes and a few sessions throughout the day. Another tip is to give your little puppy positive reinforcement as your doggy friend would do anything to fetch praises! I’m pretty sure that my dog’s best time during the day is meal time! He loves to eat, and he eats almost anything and everything! Let’s talk about what the Doberdor like to eat? The best thing about mixed breeds is that they can eat whatever their parents can! This dog is an active one so it needs a rich diet. Feed your dog 2-3 cups of dry feed per day. My recommendations will be Royal Canin Labrador Feed, Red Paw X-Series Dog Food and Rachael Ray Nutrish Zero Grain Food. Hip dysplasia is a disease that affects the doggy’s hip in which the ball and socket joint of the dog are malformed. It means that the ball portion and its socket don’t properly meet one another, which results in a joint that rubs and grinds instead of a smooth, sliding motion. Elbow dysplasia is a genetic condition which caused by the abnormal growth of cells, tissue, or bone which causes elbow pain and lameness. But, health-wise, mixed breed dogs are better off than purebred dogs. So, let’s talk about everything that we learnt about the Doberman Lab mix! The Doberdor is a loving, caring and protective family dogs that love to play and go for long walks. They are intelligent and quick learners, which makes it easy to train them. This is a large breed, and so they aren’t going to be happy in a small apartment, but they’ll love a house with a yard! ● They need a nutritious diet, so I’d recommend the Royal Canin Labrador Feed, Red Paw X-Series Dog Food and Rachael Ray Nutrish Zero Grain Food. ● They have a few medical concerns such as hip dysplasia, elbow dysplasia and eye infections, so keep a look out for them! I hope I was able to clear everything up about the Doberman Lab mix with you! Do comment below if you’ve got any queries! I have a 6 year old doberdor male, and he’s such an incredibly intelligent boy! He has the alertness of the Doberman too – unfortunately we’re now running out of words for ‘walk’ as he listens to EVERYTHING we say all of the time!! He’s great with people, children and cats, the only downside being he is selective with dogs as he’s a dominant male. A great guard dog, so easy to train and still eager to learn at 6! We love our doberdor, Sophie!